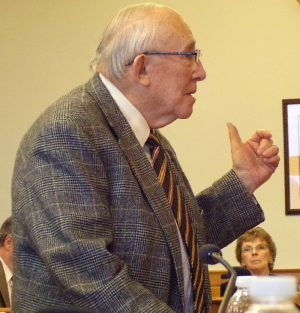 OSWEGO – Oswego County will partner with the American Red Cross to host a community blood drive in honor of former County Legislator John “Jack” Proud. It will be held from 11 a.m. to 4 p.m. April 15, in the Legislative Chambers of the County Office Building, 46 E. Bridge St., Oswego. – Hydrate: Be sure to drink plenty of fluids before and after your donation. – Dress comfortably: Wear something comfortable with sleeves that can easily be rolled up above the elbow. – ID: Bring either your donor card, driver’s license, or two other forms of identification to check in. – Medications: Bring a list of medications that you are taking, including both prescription and over-the-counter medicines. – Iron levels: Maintain healthy iron levels before donating. If possible, include iron-rich foods such as meat, fish and poultry in your diet, especially in the weeks before your donation. To make an appointment for the April 15 blood drive, visit https://www.redcrossblood.org/give.html/find-drive or call Chris Jones, Clerk of the Legislature, weekdays at 315-349-8247.